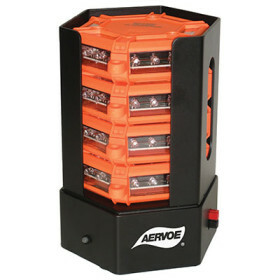 AERVOE LED Road Flare Kit (4-Pack w/ Stacking Charger) » Protective Solutions, Inc. The Universal Road Flare Kit contains 4 extremely durable, rechargeable 18-LED CLassic Road Flares that are a safe alternative to incendiary flares. These flares are smokeless, flameless, non-toxic, waterproof, crushproof and come with an impact resistant rubber housing. Ideal for road safety identification by emergency responders. Available in Red or Yellow. Flares are visible up to 1/2 mile. The metal charging/storage stand is mountable to any vertical or horizontal surface. Charge by plugging directly into your vehicle's 12V electrical system or by plugging into any 120V electrical wall socket. Both charging methods are included. May be used in any weather condition.